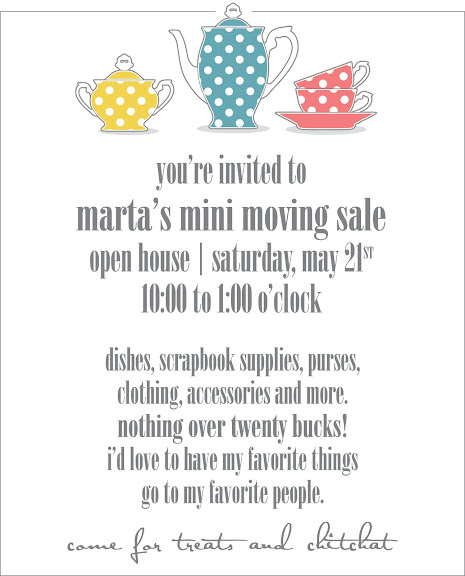 if you're interested in coming to our moving sale this saturday, i would love to see you there! we are located in idaho falls. please email me for the address and directions. oooo we are moving too! good luck with your move! Hoping you favorites find good homes and praying for a safe and smooth moving day. Cute invitation by the way. what a cute invite! i had a garage sale last weekend with lackluster results... maybe i needed a sign like this! good luck. i wish i was local because i love your style and my wardrobe needs updating. congrats btw!